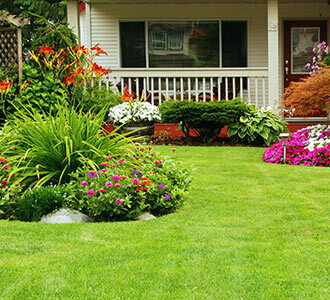 If you’re looking for the beauty of a vibrant green lawn without the costs and time that comes with maintaining fresh sod, contact Greenbloom Landscape Design to discuss artificial turf options for your property. A surface made from a combination of plastic fibres and backing to resemble grass. Often used with some variety of infill (silica sand, rubber, sand-rubber mix, durafill sand) to mimic the feel of real grass and soil. 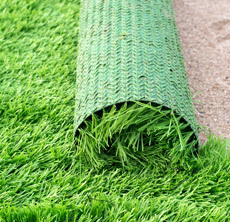 What Are the Benefits of Using Artificial Turf? Cost of installation is recouped in a few years. Clean – water drains through the backing to prevent mud and puddling. 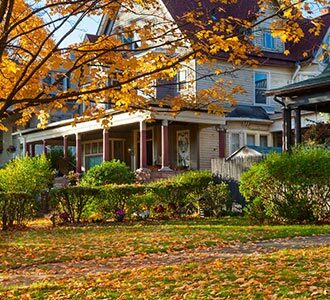 Increases resale value and curb appeal for homes. Retains shape no matter how much foot traffic over the area. Soft feel like natural grass. Resilient and holds up well. Least expensive and least durable to heavy wear. Lower melting point than other varieties. Ideal for home putting greens or decorative space. What do the Grades of Turf Mean? 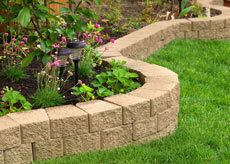 Decorative borders around patio stones. Create a base using crushed rock or sand. Roll artificial turf over the base and cut to shape. Seam turf edges together with adhesive if necessary. Attach turf to the ground using 6″ spikes or lawn staples every 3-6″ around edges, and every 2′ in a grid pattern through the middle. Lay infill and brush or rake it into turf. Water turf to help settle infill. Rinse once every 1-2 weeks. Use flexible rake or stiff broom to remove larger debris and refresh turf monthly. Remove solid pet waste and rinse away liquid. Apply turf deodorizer if desired. Allow snow and ice to melt naturally. Keep hot materials away from turf. Rinse spills or apply mild soap or vinegar and water mix.